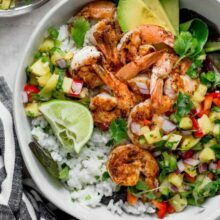 Shrimp Bowls with Coconut Cilantro Lime Rice and Pineapple Salsa can be on the dinner table in 30 minutes! This refreshing and simple meal is a summer favorite! In the summertime, we tend to keep our meals super easy, but don’t let super easy scare you away. Super easy doesn’t have to be boring. Super easy can be super delicious, just like these shrimp bowls. There is nothing boring about them, they are the perfect summer meal. I love bowls because they are so simple but always so good because all of the extras. 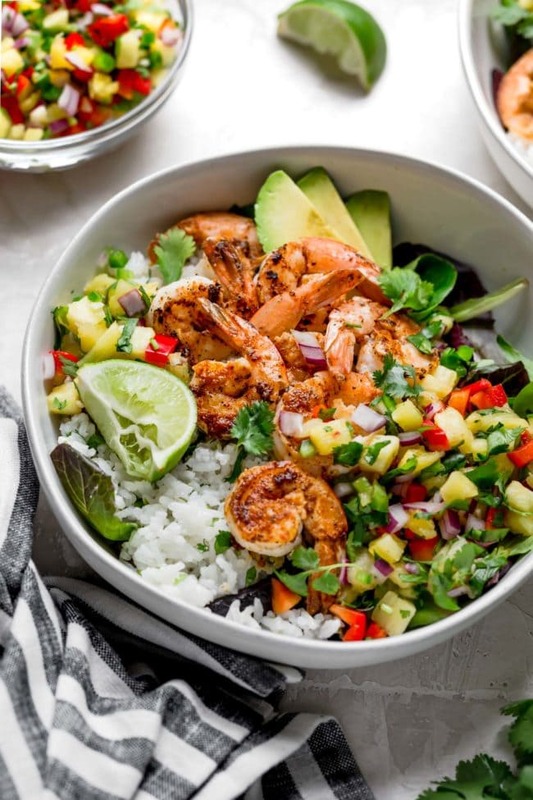 These shrimp bowls have coconut cilantro lime rice and are topped with our favorite pineapple salsa. 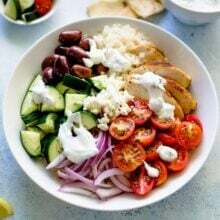 These bowls are loaded with flavor and only take 30 minutes to make, which makes them perfect for summertime. Plus, you will feel like you are on a tropical island while you are eating them. I am all about bringing the summer vacation vibes into our meals. Next up, the shrimp. Make sure you buy raw shrimp at the store that has been peeled and deveined. Season the shrimp with garlic powder, chili powder, smoked paprika, and a little oregano. Cook in a skillet for 1-2 minutes. Yep, these little shrimp cook up in no time. If you wanted to grill the shrimp, you could also fire up the grill and grill them for a few minutes. I know some people don’t believe in cooking indoors during the hot summer months and that is totally fine by me! Now let’s talk about the pineapple salsa. 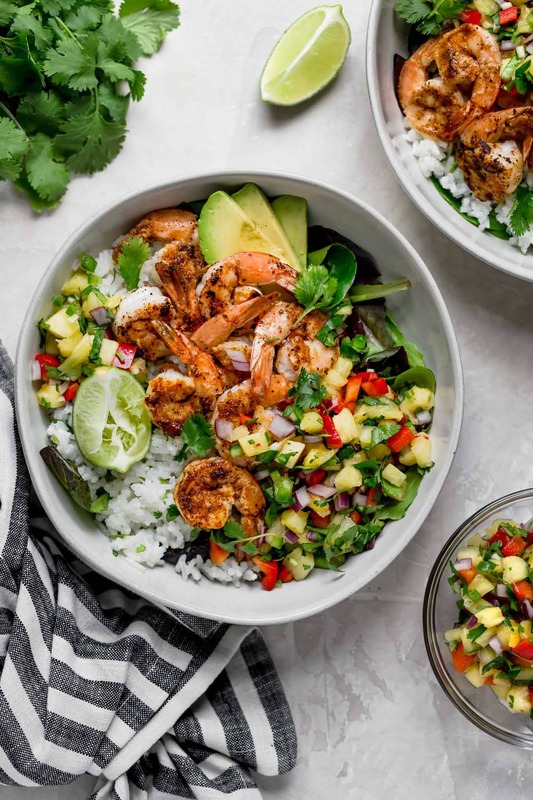 This fresh and vibrant salsa is the perfect flavor and color booster to these shrimp bowls. The pineapple salsa is the perfect compliment to the spicy, smoky shrimp. 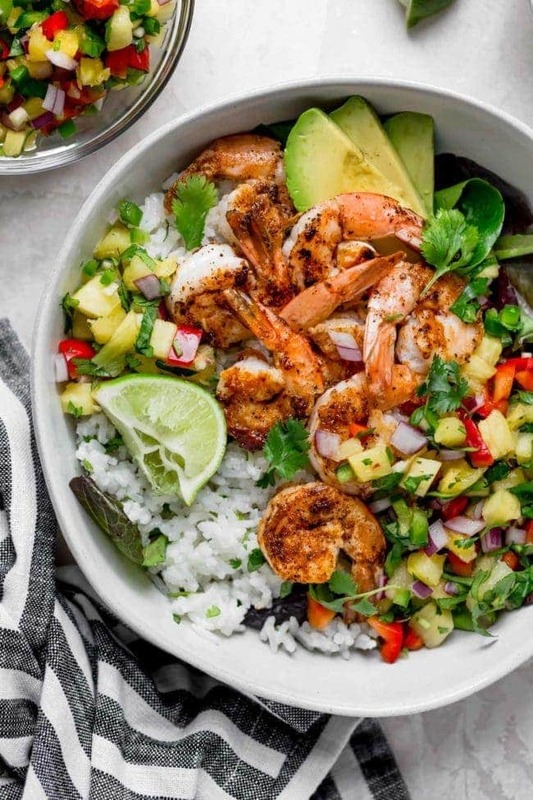 The salsa cools the shrimp down and adds some tropical flare, again, making these bowls perfect for summer! To assemble the bowls, add a scoop of rice to the bottom of a bowl. Top with the shrimp, the pineapple salsa, some sliced avocado, extra chopped cilantro, and a spritz of lime juice. BOOM, now you have the most perfect summer meal ever and it is SUPER easy! Oh, if you aren’t a shrimp fan, you can use grilled chicken instead. And if you are vegetarian, you can skip the shrimp and use black beans, my personal favorite. Feel free to mix it up! It’s summer, HAVE FUN! A super easy weeknight dinner that only takes 30 minutes to make, start to finish. This fresh and simple recipe is a favorite during the summer or any time! Cook the rice: Add the rice, coconut milk, and water to a medium saucepan over medium heat. (Quick note: be sure to double check the cook time and the liquid for the particular rice you have - they’re all a little different! As a rule of thumb, you’ll want 1 part coconut milk to 1 part water.) Bring the mixture to a boil, then reduce to a simmer, cover, and cook until all the liquid is absorbed per the time indicated on your rice’s package directions. 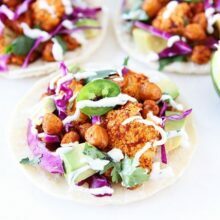 Remove from the heat, add in 2 of the tablespoons of coconut oil, the lime juice, and the cilantro, and fluff with a fork to combine. Cook the shrimp: Add the remaining 1 tablespoon of coconut oil to a large nonstick skillet over medium-high heat. Lay the shrimp out on a cutting board and, using a paper towel, pat them dry. Season with the garlic powder, chili powder, smoked paprika, dried oregano, and ½ teaspoon each salt and ground black pepper, tossing to coat the shrimp well. Add the shrimp to the skillet, arranging them in a single layer - you may have to work in batches - and cook for 1-2 minutes per side, until the shrimp is pink & opaque. Transfer the cooked shrimp to a plate and set aside. Assemble the bowls: Add a scoop of rice to the bottom of a bowl. Top with the shrimp, the pineapple salsa, some sliced avocado, extra chopped cilantro, and a spritz of lime juice. Enjoy! Shrimp and lime go together so, so well! We made it as recommended but replaced the rice with shredded cauliflower. Loved it a lot! This is a summer night dinner must! 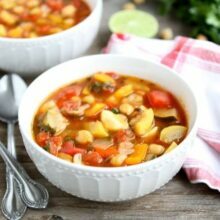 wonderful summer recipe and not bland with a nice balance of flavors, thank you! Could you use brown rice? Looks amazing! How much water should I add with the coconut milk in rice? Delicious! Made the shrimp, the rice (sans coconut due to guest’s preference) and salsa. Delicious. Chili powder perhaps a little to forward tasting – maybe a smaller proportion and something else to kick up the heat such as more cumin or jalapeno! Made salsa with mango – yum! I made this last night, and it was delicious!! The next time I’ll try it with the beans; that sounds great too! 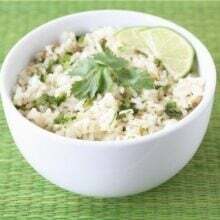 If I wanted to make this rice in the Instant Pot, how much of the total liquid would you recommend be the coconut milk? This looks good! Do you know the nutrition content of this! Like sodium content, fiber, sugar etc. thank you very much!